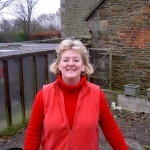 I am a farmers wife and author while also running an animal sanctuary down on our farm in Derbyshire. I write short stories and novels mostly about animals. Animals are my passion especially my dogs and horses. I have been writing for many years and get a lot of help from my family. My brother edits all my work and polishes it nicely for me. However he has not looked at this bit so I will no doubt have lots of mistakes! I have always struggled to spell and the fact that I have lots of work published, including books, it shows anyone can do it. I love baking cakes for my family and I like eating what I make. I keep chickens so love to bake with my wonderful free range eggs. I ride my horses daily and have done so since I was a wee girl. Although getting on and off is not so easy now I get such a huge joy from galloping over the fields. I teach riding and love to encourage the young children I teach to be kind to their horses as this is sometimes not encouraged enough. I work for Redwings Horse Sanctuary and the British Horse Society as a local horse welfare officer. I love my work although it can be sad sometimes. I have had several books published one by Elliot Right Way and three others on kindle. I have a book coming out at Christmas called Animosity Farm. This is a true story and is a must if you like true life tales full of joy and sadness. I have worked with young children and I teach horse riding and give lectures.